I promised Paul I’d make homemade dinner rolls again this week that we could eat with the left over Tortellini Meatball Soup. 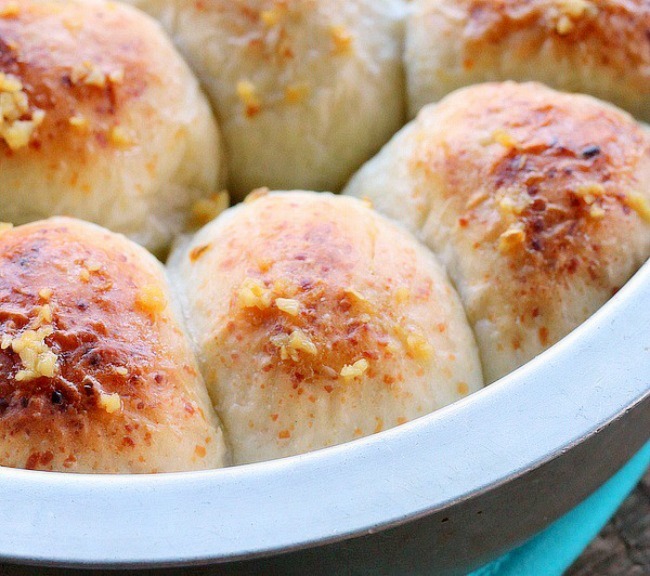 Since the soup has such a great Parmesan Cheese flavor I was thinking in the order of making rolls that I could put cheese in. I’ve never added cheese to yeast rolls before so this was new to me. I found this recipe on Taste Of Home, I knew it was going to be good! The recipe only takes minutes to put together, the first rise time is only 10 minutes, after that the rolls are shaped and rise again, then baked. 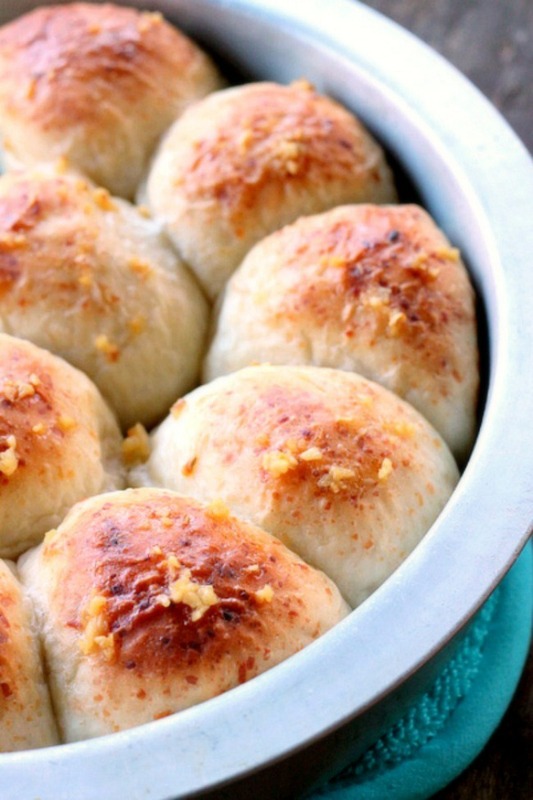 It was exactly what I needed, an easy flavorful dinner roll. Since I was putting a great cheese flavor inside the rolls, why not put a great flavor on top of the rolls? After the rolls were baked I buttered the tops, the jar of minced garlic I keep in the fridge made it easy for me to add a touch of garlic to the top of each buttered roll. They went back into the oven for about 5 minutes. They were absolutely delicious! 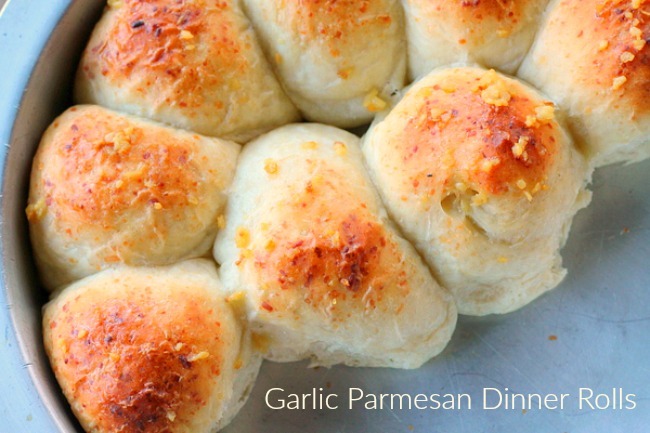 The rolls are soft, the Parmesan flavor was mild and the garlic on top added just a touch more flavor to these already fantastic rolls. I hope you love them as much as we did, ENJOY! In a large bowl, combine 1-1/2 cups flour, sugar, yeast and salt. Add water and 2 tablespoons butter; beat on medium speed for 3 minutes or until smooth. Stir in cheese and enough remaining flour to form a soft elastic slightly tacky dough. Turn onto a lightly floured surface; knead until smooth and elastic, about 4-6 minutes. Cover and let rest for 10 minutes. Divide into 13 pieces. Shape each piece into a ball. Place in a greased 9-in. round baking pan. Cover and let rise in a warm place until doubled, about 30 minutes. Preheat oven to 375°. Bake 11-14 minutes or until lightly browned. brush the tops with the remaining butter, top each roll with a dab of minced garlic. Return to oven for 5 minutes. Serve immediately. Yummy yummy for the tummy. Can you please come to my house in Orlando and bake ANYTHING with yeast in them? It’s been years since I’ve had homemade yeast anything.